What’s an “aha” moment? You’ve experienced it. It’s that moment of connection, the moment of realization when finally someone explains something in a way that you can understand. 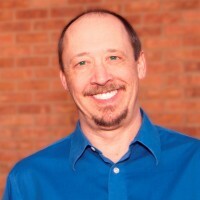 My name is Ross Barefoot and I love conducting SEO workshop training for the Rocky Mountain Search Engine Academy because I love helping business people have those “aha” moments about their website and the world of online marketing. I’ve been active in web development for 15 years, and I’ve been active in small business for 35 years. I can relate — as a business person and not as a “geek” –to the struggle you may be having: You need a glass of clarity but someone has a firehose of information pointed at you. I spent the first decade of the new millennium as the owner of FLEXISS Digital Design, a web development and internet marketing firm I founded to bridge the gap between business people and technology. My mission at FLEXISS was to help businesses discover and achieve their website goals, and we take that seriously (and by the way, Scott Callas, a friend of mine who is the current owner of FLEXISS, has the same goal, so look him up if you need web development expertise). Let’s face it, to succeed in the world of Google, Bing, Facebook, Youtube, Twitter, Linked In and a constantly changing world of competitors it’s not enough to have a good website. It’s also necessary to connect with the right audience and in the right manner. That’s a skill that I’ve been working on since 1996. In 2002 I took my first formal search engine optimization training with John Alexander and Robin Nobles, the founders of the Search Engine Academy, and was so happy with their approach I returned for their advanced course in 2004. As of 2011 I became an instructor with the Search Engine Academy and so it seems I have come full circle. Whether it is through leading workshops, mentoring students, or consulting with business owners, my ultimate desire remains the same: to help you discover and achieve your website goals. It will start with that first “aha” moment.